The advent of prostatic biopsy — whether performed as needle biopsy or needle aspiration biopsy — has made it possible preoperatively to diagnose prostatic diseases with acceptable accuracy. It has also made it possible, at least theoretically, to follow histologically the effect of a specific treatment by performing serial prostatic biopsies. The diagnosis of benign prostatic hypertrophy is largely a clinical one, whereas the final diagnosis of prostatic cancer is a microscopic one. 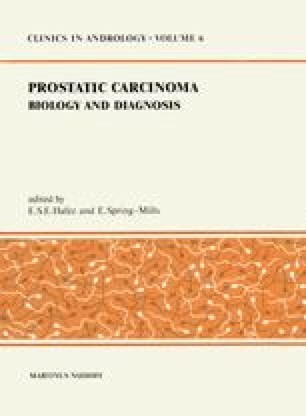 The diagnostic value of needle biopsy for the diagnosis of cancer of the prostate has been discussed in the preceding chapter.